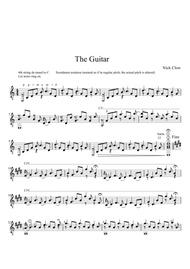 Composed by Nick Clow. Contemporary Classical, Etudes and Exercises, Repertoire. Score. 2 pages. Published by Published by Nick Clow (S0.287233). This is an advanced intermediate solo guitar piece - around Trinity Grade 6. You can find a performance on YouTube. My scores are intentionally devoid of expressive and dynamic markings (even tempo indications). Dynamics and other markings not only seem crude to me, but also imply there is only one interpretation of the piece. There should be significant development of dynamics, tempo and colour within my pieces, but I leave this to the interpretation of the player.